What a Wednesday night! The Rockets did so many things right that they’ve done wrong this season, like making plays in crunch time. And doing it against the world champion LA Lakers. Although the Lakers have lost 4 in a row, the first time that’s happened since April 2007, it still counts as Houston’s finest win of the season. And it comes only two days after getting torn up in Dallas, putting them in one of their deepest valleys in this tumultuous season. The question now is if they can keep it up, especially after disappointing their fans several times this season after encouraging victories. If they don’t, at least we can enjoy the memory of a full crowd at Toyota Center sticking around — and standing and cheering — until the very end of a game. It reminded me of the playoff game atmosphere from a couple of seasons ago when they won 3 games at home in front of electrified home crowds to take the Lakers to 7 games. Fans were high-fiving each other and jumping up-and-down. That’s what we live for, and we haven’t had much of it this season. 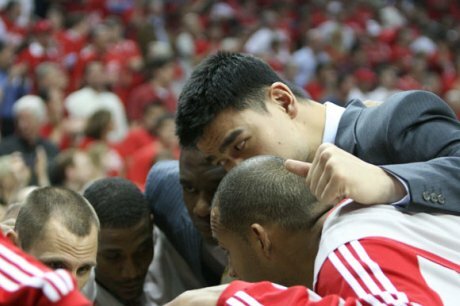 Houston fans also received good news before the game that Yao, who participated in a shootaround with the team before Wednesday’s game, may be able to get back to action next Tuesday night against Detroit. And Aaron Brooks got in some court action, too, and may return 3 days after Yao against Milwaukee. Just the THOUGHT of having those guys on the practice court with target return dates had to give their beleaguered team a lift before facing the Lakers. But the man of the hour was Shane Battier, who went on a tear to score 11 points in a row in the final 3 minutes of the game to overcome a 97-94 lead the Lakers had built. You know a performance like that from Shane won’t happen again anytime soon, but the Rockets will take a player who steps up in crunch time any way they can get it. Shane Battier defends against Kobe Bryant, but in the end, it was Shane’s offense in the last 3 minutes that gave Kobe and the Lakers trouble. Click here for more photos from the game. And Shane did most of his damage after halftime, not making a bucket the entire first half. The 3-pointers he hit were huge, of course, bringing down the house and befuddling the Lakers. But the most amazing shot for Shane during his run came after Kobe fell down trying to defend him, and in Kobe-like style, Battier took advantage of his mistake, dribbled once, and put up a tough shot with his body still moving somewhat, and drained it! He basically created his own shot without having any time to think about it — that’s not how Battier does it! You know when that shot went in, the Rockets were destined to win, and they did so by going on a 22-6 run to end the game. My rule-of-thumb from a few seasons ago continues to prove me right: if Battier scores, the Rockets win. There’s probably no other stat from any player on the roster that’s correlated more to the Rockets winning games than that one. From a team perspective, it’s no surprise that when the Rockets hit more 3-pointers than their opponent, they win. That was the case again Wednesday night, hitting 10-of-22 (46%) compared to 5-of-16 for LA. I’ve been thinking this season that people have overreacted and overestimated how good the Lakers are. Sure, they’re good, but people forget that Boston almost took them last year in the Finals with no Kendrick Perkins in Game 7, Kobe had a terrible game in that game, they were saved by Ron Artest (who had 4 points against Houston Wednesday night) having the game of his life in that Game 7, and the refs started making calls completely different in the 4th quarter from what they had called in the previous three. If Perkins had played, Artest hadn’t shown up, or the refs had stayed consistent, people might be thinking the Lakers are good, but not that good. All of a sudden with that win, they have become larger than life, and everyone now thinks they are better than what they really are. But hey, at least it makes for good theater, and if a victory over the “back-to-back” champions helps create more confidence for Houston, I’m all for it. One key point of the game that gave Houston hope was when they went on a 13-2 run at the end of the first half to cut the lead to one point before Kobe hit a jumper at the buzzer to give LA a 56-53 halftime lead. Without that, I think the Rockets would have gone into halftime with much less confidence. FoxSports Houston reported at halftime they could hear a lot of energy and yelling (the good kind) coming out of Rockets’ locker room, emboldened by what they had done to close out the half. Perhaps that finish to close-out the first half propelled them to excel in the second half. Jordan Hill did a much better job in the second half on Pau Gasol, who only scored 8 points in the game on 2-of-8 shooting. Hill outscored him with 10 points. By cultivating Hill through the first 17 games of the season, perhaps the Rockets have found their athletic big who can go up against the best of them. No better way to make Houston fans forget about not signing Erick Dampier. I love how Hill, a throw-in to the Tracy McGrady/Kevin Martin deal, is surprising people with his progress. Just a few weeks ago people were thinking the kid was a bust. You have to give Rick Adelman credit for giving him playing time, and Daryl Morey and his staff credit for acquiring him as an afterthought to the McGrady deal last year. And you have to give credit to the much maligned Houston bench, who outscored LA’s bench 40-30. – So Wednesday night a 5-12 Texas team (Houston) beats a 13-5 LA team. Strangely on the same night, a 4-14 LA team (Clippers) beat a very good 15-2 Texas team (San Antonio). It was a night for the underdogs. Anything can happen any given night in the NBA. – When I saw Kobe warming up with the red-and-white shooting shirt for Wednesday’s World AIDS day, it made me think what he would have looked like as a Rocket. It also made me think back to a few years ago when the Rockets had a chance to trade McGrady for Kobe when he was disenchanted with LA and was thinking of leaving. Just image how much of Houston and LA’s fate might have changed over the past few years if that trade had occurred! I know it’s only the first game of the season, but the Rockets should have beaten the Lakers at Staples Center Tuesday night. The Rockets looked awesome in the first half, scoring 62 points and leading by 12 points at halftime, and they even held a 15-point lead in the second half. I thought they were on their way to dominating with guys like K-Mart, Aaron Brooks, Courtney Lee, and Chase Budinger scoring in bunches. But then the young guns went cold in the second half, and Laker reserve Shannon Brown killed them with four 3-pointers in the 4th quarter to save the Lakers from losing on the same night they got their championship rings. It also didn’t help that Brooks left Steve Blake wide open with a 3-pointer to give the Lakers a 2-point lead with 18.8 remaining. Houston should have won this game, but they couldn’t seal the deal. Even the usually eliable Luis Scola was missing shots he would normally make, making only 4-of-14 shots and keeping the Rockets in a hole before redeeming himself by making 3 of his last 4 shots to give them a chance to tie or win it. But then with 2.4 seconds remaining and down by two points, the Rockets ran a pretty dumb play when Shane Battier inbounded the ball to Brooks who had no chance of getting a shot off with Blake and Lamar Odom there to collapse on him. Maybe A.B. should have put up a shot earlier by banking a runner off the glass, but he opted to go underneath the rim, and there was no chance — it was blocked. Game over. Yao looked good at times in his first regular season game back since May 2009, but he missed a few shots he normally would make. That will improve over time. He finished with 9 points on 4-of-11 shooting, 11 boards, 2 blocks, and 4 turnovers in 23 minutes and 21 seconds before fouling out, just 39 seconds before reaching his 24-minute limit. But like what you’d expect from a young team, they collapsed down the stretch and let the Lakers steal one in their own gym they had no business winning the way the Rockets were dominating offensively through most of 3 quarters. Battier was awful offensively, making only 1-of-5 shots as a STARTER. And he didn’t do that great of a job on Kobe Bryant, who scored 27 points on 8-of-20 shooting. Meanwhile, Chase finished with 13 points on 6-of-10 shooting in just 21:41. Does Shane deserve to remain a starter if he keeps repeating disappearing acts like years’ past? 8:53 – Yao misses a short chip shot. He got the rebound, but couldn’t convert then, either. 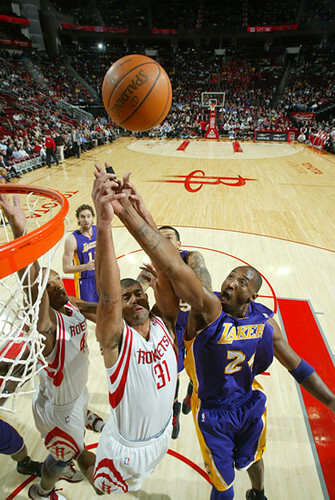 7:30 – Yao was called for a foul inside on the offensive boards. 6:50 – Yao intimidates Artest in the lane to alter Ron-Ron’s shot and make it come up short. 4:56 – Yao loses control of a rebound to Artest underneath he basket, but he holds his position well and Artest does his normal thing by trying to force up a shot with Yao hovering over him. The ball goes out of bounds off Yao. Yao checks out of the game for Brad Miller. 7:25 – Yao grabs an offensive board and lays it in. 5:39 – Odom grabs an offensive board over Yao and scores over him. 6:56 – Yao grabs an offensive rebound and tries to throw it down over Gasol, but Gasol fouls him. 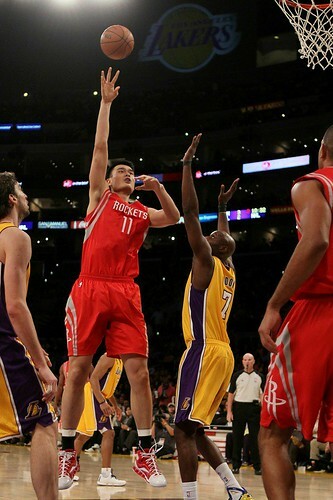 9:35 – Yao makes a nice move to the basket but misses a layup. I’m surprised he would try a move like that so early in the season being so rusty. The Rockets’ guards throw up two consecutive jumpers when Yao’s minutes were running out. Why not use him while they can? This is a fascinating thread I found on a Laker fan site. Some say a Laker loss on Sunday to the Rockets in Game 7 could be the worst in Laker history, but be one of the biggest upsets in sports history. Gotta give credit to the people in there who are giving props to the Rockets for showing so much heart in this series. On another note, I went on the the Lakers’ Ticketmaster site where fans can buy tickets from other fans through a program called TicketExchange, and I’m amazed at how many tickets are being sold by Laker fans for the right price. Maybe it’s an indicator of these sellers’ lack of confidence that their team can pull it off. We all know the Rockets are playing to win for the fans and themselves. But one thing I can’t believe that hasn’t been discussed at all among the local or national media (maybe they will after they read this post) is that in four attempts, Rick Adelman has never beaten Phil Jackson in a playoff series, going 0-for-4. The first series loss was in the NBA Finals in 1992 between TrailBlazers and Chicago Bulls. Then Adelman lost 3 playoff series in a row to the Lakers as coach of the Sacramento Kings in 2000, 2001 and in 2002. That 2002 series was the Western Conference Finals, a series in which disgraced referee Tim Donaghy said wrong calls were intentionally made in Game 6 to force a Game 7. So let’s win this game for Adelman, too, because he’s probably too soft-spoken to ever admit that he would like to beat Jackson at least once in a playoff series. It’s still amazing to think how the Rockets defied the oddsmakers who marked Houston as 9-point underdogs before Game 6, and had them down as 70-1 favorites to win the championship. I don’t know what their odds are now, but something tells me it’s better than 70-1 now. Funny how one stunning win can change everything. I bet there are a lot of people who wished they had put money down on that game and the Rockets’ chances of winning a ring. One of the stats that I thought was amazing is that the Rockets are now 13-2 this season after suffering double-digit losses. Also, the Lakers have only scored 36 points in a first half only twice all season long, and those two games happened to be in Games 4 & 6 of this series. And the Rockets only had 1 TO in the 4th quarter. They have matured and evolved so much the past few months. Remember just a few months ago how we were talking about how they didn’t have poise in the 4th quarter? And did you hear how the Rockets-Lakers game on Thursday was the most watched NBA game on ESPN in that network’s history? This is the obviously the most anticipated Game for the Rockets in 12 years. One thing for sure is that Houston fans will remember this team for a very long time, win or lose Sunday afternoon. This year’s Rockets team reminds me, when I was a kid, of the 1980-81 Rockets making an improbable run to the NBA Finals with a 40-42 record led by Moses Malone. And people forget that in the playoffs the 1981 team unbelievably BEAT THE LAKERS led by Magic Johnson and Kareem Abdul-Jabbar in a best of 3 series! I think the reason why the first round playoff series were “Best of 3” back then is because the disparity between good and bad teams was so large, they thought there was no way a top seed would lose to a lesser-seeded team in the first round. This year’s Rockets team is like that 1981 team, except with Yao now out, imagine that team without Moses! No way that 1981 team could have gone as far as this one has without Moses, which makes the last two victories this team has had over the Lakers in this series even more impressive. No one on that team really matches Luis Scola, who has so many moves down low, except when he shoots from the top of the key, there are some Rudy T. similarities. Looking ahead to Sunday’s game, the Rockets need big games from Aaron Brooks, and I’d love to see Carl Landry rattling some rims like he did on Thursday night, and Scola dominating down low. It would be nice if Artest had a bounce-back game statistically. If he did, and the other players come through, then this game is a lock. So here we go! It doesn’t get much bigger than Sunday’s game! This is what it’s all about – these ‘unknown’ players showing how good they are on the world stage. All I know is that if the Rockets win Sunday, it could be one of the greatest series upsets since the #8 seed Golden State Warriors defeated the #1 seeded Dallas Mavericks two years ago. If the Rockets do win, do you think their win would be bigger than the Warriors beating the Mavericks in that series? If so, why? (without citing the obvious reason that Yao is out). If the Rockets win, I can’t wait to hear Jim Rome’s show Monday morning. I like Romie, but he’s an unabashed Laker fan and cracked down on the Lakers after they lost to the Rockets after Game 4 and Game 6. The Rockets continued their run of stunning almost everyone around the league Thursday night. After being smacked down by 40 points against the Lakers Tuesday night, they resurrected themselves in an elimination game (down 3-2 in their series), coming up with one of their most inspiring victories in years when everyone thought they would lay down and die. 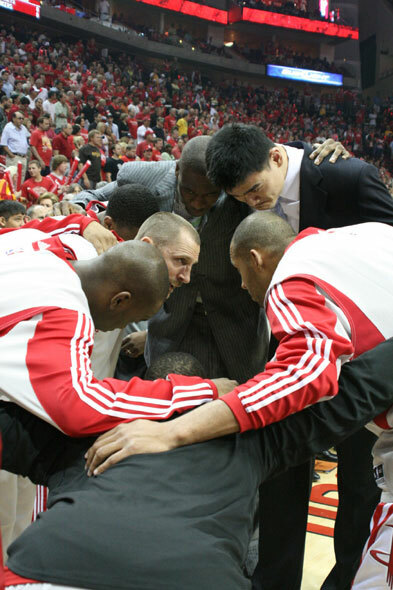 Yao continues to join his teammates in pregame huddles to show his commitment toward his team. 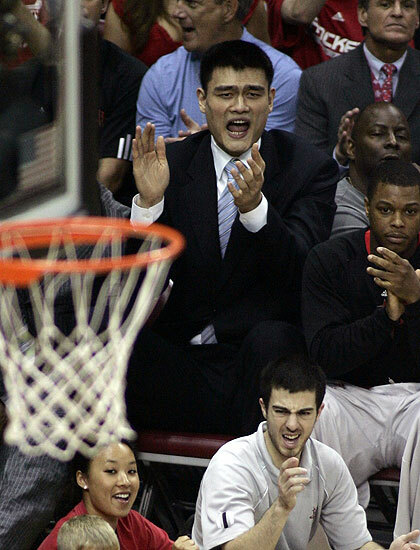 Click here for more photos of Yao at the game. What else can be said about this Rockets team that hasn’t already been said in Houston?…well, almost everyone in Houston except for one particular Houston Chronicle columnist I referenced earlier today who thought the Rockets were dead on arrival, trying to bring down the whole town to his depressing level. We all know the national media hasn’t given much to what the Rockets have been able to do this series against the Lakers. The chatter has been all about how the Lakers are making stupid mistakes and aren’t playing with energy or commitment, and how they should be “embarrassed” playing down or below Houston’s level. As much as my brain or the oddsmakers told us they had no chance Thursday night (9-point underdogs), my heart told me they could show that amazing resiliency at least one more time. Every game they win against the Lakers, it seems like it’s a different player, or players, who step up and surprise them. It could be Aaron Brooks, Shane Battier, or Chuck Hayes like in Game 4. However, I knew it was just a matter of time before the Rockets’ power forwards would make their impact late in this series. Luis Scola and Carl Landry had almost become forgotten men. Scola had only averaged 11 points per game in this series before Thursday night, not scoring more than 12 points or hitting more than 5 field goals in any of those games. Well, Scola knew it was time for him to step up in a do-or-die game, and he erupted by doubling his series averages, scoring 24 points on 10-of-17 shooting, including scoring 14 points in the first quarter on a variety of slick offensive moves and jumpers that made him a tough cover. Oh yeah, he also grabbed 12 boards, AND HE WAS DOING IT WITHOUT YAO MING IN THE LINEUP to give him more “open looks.” Scola scored in the heart of the Laker defense over Pau Gasol. 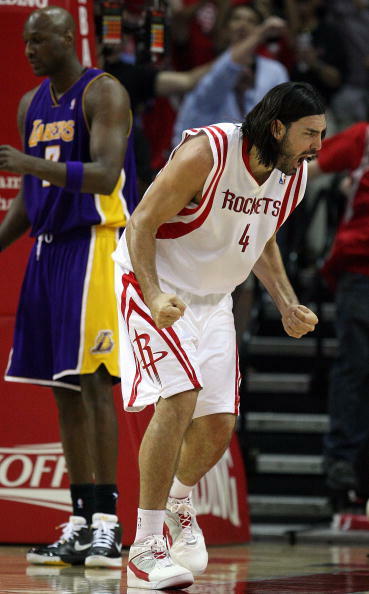 Luis Scola is pumped after an impressive bucket he scored in the low post. Click here for more action photos from the game. This type of performance is the reason why I was so ecstatic to hear before last season started that the Rockets had landed a savvy, skilled, and seasoned veteran power forward in Scola who could score in the low post. Meanwhile, Landry had only scored 2 points in that incredible Game 4 win, and 9 points in the Game 5 blowout. So he was due for a big game. He delivered when they needed all hands on deck. Landry attacked the rack like we’ve seen so many times before, especially during that 22-game winning streak last season, but not much in front of a national TV audience where he could show how athletic he is. Landry would make all 6 of his shots, almost all highlight reel plays, for 15 points. He also grabbed 9 boards and had 2 blocks. And Aaron Brooks was money at home again, scoring a game high 26 points on 8-of-13 shots. He knew if he was going to be effective, he had to recapture some of that same Game 4 mojo back where he scored 34 points by penetrating into the lane and being aggressive with his shot. This is all good for Yao Ming fans, you know. With the success of players in this series like Brooks, Battier, Scola and Landry, they are going to be so much better next season playing with even more confidence. Because of it, the Rockets could be THE major force in the West once Yao returns to the lineup. And they could even become what the Spurs have been the past few years. Ron Artest had a slightly better game than he’s had recently, scoring 14 points and hitting a couple of big buckets. I have to admit when he launched some of those shots, I was wondering what in the world was he doing? But then they went through the basket, and I’d say, “Whew!” Artest would only make 6-of-17 shots on the night, but he had 3 assists. Just think how convincing these wins would be once he starts hitting for a higher percentage. There was so much to this game, I could keep writing and writing. But since we have almost 3 days before Game 7 in LA, I’m going to call it a night, but you can bet I’ll be back to write more in the next 48 hours. I’ll leave off on this note, though. The last time a Texas team went to LA to play against a heavily favored opponent to win something major where no one gave them a chance, it was the Texas Longhorns facing the USC Trojans in the 2006 National Championship Game at the Rose Bowl. No one gave Texas a chance, and looked what happened in that one! The question is, who can be the Rockets’ “Vince Young” on Sunday? If I were a betting man, I think it will be a team effort, just like it has been all series long. Here are more interviews I recorded yesterday. I always love listening to the players unedited because you’ll never know what you’ll pick up that you didn’t know before. You are currently browsing the archives for the vs. LA Lakers category.